Stitch markers are very useful little things. So below I have listed the four main ways I use them! Don't want to lose your place? 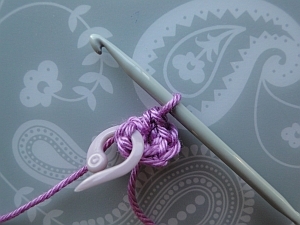 Use a stitch marker! For patterns with many stitches along a row, you might want to pop in a stitch marker every 20 or 50 stitches to help you double-check your stitch count for that row. This stitch marker says "Stop! Don't stitch in here! Turn your work!" When working in the round, continuous rounds do not join at the end of the round - they just carry on in their merry old way! I like to mark the 1st stitch of my next round; then I can work into the last stitch without taking out my marker. The beginning of the 3rd round. 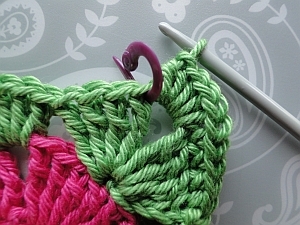 There are some nice tips for using stitch markers for amigurumi in this article from FreshStitches. 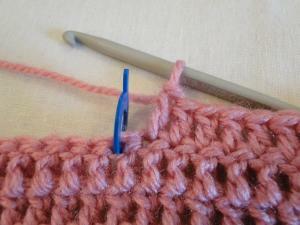 You might sometimes wonder where the top of a stitch is! 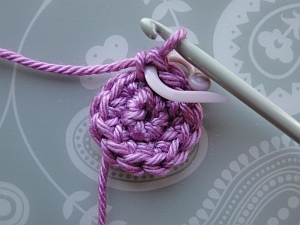 To find out, work your stitch and place a stitch marker under the top two loops. Then, when you come to that stitch again to work into it on your next row or round, you'll know you're in the right place. The stitch marker marks the spot! I wanted to work into the 1st of the four stitches in the round below. So when I was checking my pattern, I worked my round and put a marker in the top two loops of the stitch. When I arrived at this point on my next round, I knew I would work into the right stitch, even though it's almost hidden by my corner stitches. 4. Keeping a Stitch "Open"
Ch 2, work 6 sc (UK dc) into 2nd chain from hook. Then join with a ss into 1st stitch. Hmmm... that's all well and good, but when working with some yarns, it's a fight to get my hook under the top 2 loops of my 1st stitch, because it's decided to become verrrry tight! So sometimes, to save myself the bother, I work two of my stitches, pop a marker into the first one, then work another four, take out the marker, and slip stitch easily into the first stitch to join! Take out the marker - and make the join. There are various kinds of stitch markers you can buy - and you can see that I am using the "open" type which I do like. BUT - they do fall out occasionally, which does rather defeat the purpose! So when I see some markers that you can close up, I might try those.